Recently, Dr. Taubman alerted me to posts regarding the Paleo diet that he thought I should comment on. Below are some of the statements made by Paleo enthusiasts about beans and other legumes along with my views on the matter. 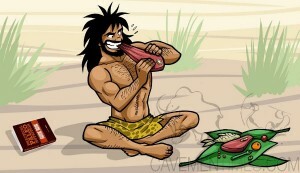 If I don’t sound convincing enough, please read Dr. McDougall’s post on The Paleo Diet Is Uncivilized. Why is this a problem? No one eats these foods raw. Why don’t you try eating hamburger and chicken raw, and compare the toxicity of these with legumes? You can write about it while you’re recuperating in the hospital! Phytic acid, also known as phytate or as inositol hexaphosphate (IP6) is also an incredibly potent anti-cancer phytochemical, as I discussed in my book. The science is actually crystal clear that the reduced absorption of IP6 that occurs from eating legumes and whole grains does not pose a risk for making people deficient in these minerals. Want to know about your heredity risk of cancer? Dr. Taubman offers Cancer Genetic Counseling. These properties actually have the potential to help with weight loss; they shouldn’t be avoided, they should be increased in our diets. This was found in ONE study. All the other evidence has shown a LOWER risk of bladder cancer with higher soy intake, consistent with the effect of soy on several other common cancers. On the contrary, several studies have demonstrated that soy isoflavone (SIF) supplementation can improve aspects of cognitive function, and the phytoestrogens in soy have been shown to reduce Alzheimer’s Disease (AD) related pathology. Any diet should get people to eat at home more. This is not justification for eating meat, eggs, and cheese three times or more each day; animal meats and products have been associated with higher inflammation in the body. Inflammation is linked to many chronic ailments including heart disease, cancer, diabetes, and arthritis. Sounds like a great topic for next week’s blog!! If you are interested in learning more about nutrition, weight loss solutions, and the steps you need to take to get healthy, schedule an appointment with Dr. Taubman and our certified nutritionist! If you are interested in starting a new diet, consult your physician first. Fad diets can often be dangerous. It is important to eat a well-balanced diet with whole foods that offer the right nutrients for your body. To learn more about dieting and starting a healthy diet regimen, contact Dr. Taubman at Olney Medical to schedule an appointment at our office in Olney, Maryland!